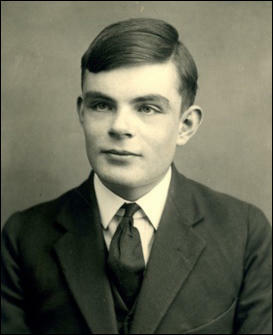 Alan Turing, the younger child of Julius Mathison Turing and Ethel Sara Stoney, was born in London on 23rd June, 1912. His father worked for the Indian Civil Service in Madras. For a while Ethel Turing lived in St Leonards-on-Sea with her two sons. His brother, John, had been born in 1908. Alan's mother claimed that "Alan was interested in figures - not with any mathematical association - before he could read and would study the numbers on lamp posts, etc." However, he seems to have had difficulty with other skills. Alan showed little interest in reading. Then he was given a book that fascinated him and he taught himself to read in three weeks. In his spare time he liked building gadgets. He also carried out experiments. A woman who looked after him in school holidays wrote to his parents complaining that Alan was always doing dangerous things. His mother told a friend: "I am sure that he will blow up himself and the house one day." Alan Turing's parents continued to live in India. In 1918 Alan went to St Michael's Primary School in Playden. When he left three years later the headmistress said: "I have had clever boys and hard-working boys, but Alan is a genius." When he was ten years old he was sent to the Hazel Hurst Preparatory School. Over the next four years he developed a passion for mathematics and science. His (Alan Turing) clear aptitude for science and mathematics did not stand him in good stead in a school (Hazel Hurst Preparatory School) that specialized in teaching Latin, Greek, literature and the classics in preparation for public school. Turing's spelling and grammar were poor - and remained so throughout his life. My father, on the whole, either ignored my brother’s eccentricities, or viewed them with amused tolerance but there were deep dudgeons when Alan started to accumulate appalling school reports at Sherborne... The only person in the household who was forever exasperated with Alan, constantly nagging him about his dirty habits, his slovenliness, his clothes and his offhand manners (and much else, most of it with good reason) was my mother. If this was due to some early recognition of his genius, she was certainly doing nothing to foster it by trying to press him into a conventional mould. Needless to say, she achieved nothing by it except a dogged determination on Alan’s part to remain as unconventional as possible. He (Alan Turing) even made a few friends, among them Victor Beuttell, whose father, Alfred Beuttell, had in 1901 invented something called the "Linolite electric strip reflector lamp". In 1927 Beuttell was at work on a new invention, the "K-ray Lighting System," which was intended to provide uniform illumination for pictures or posters. When he asked Turing to help him find a formula for determining what should be the proper curvature of the glass used, the boy not only came up with one immediately but pointed out that the thickness of the glass would also affect the illumination - something no one else had noticed. Beuttell gratefully made the necessary changed, and the lighting system was soon put into production. Alan Turing was sent to Sherborne, a 300-year-old public school in Dorset... He did not excel at his new school. Even his mathematics was "not very good". His report said: "He spends a great deal of time in investigations in advanced mathematics to the neglect of his elementary work." In his science lessons, which occupied just two hours a week in the classical curriculum, "his knowledge is scrappy", while his housemaster complained that he was "trying to build a roof before he has laid the foundations". However, knowing Alan's aversion to games, his father had requested that Alan substitute golf for cricket. This gave him the opportunity to walk around thinking out problems. As a result he won the school's Plumptre Prize for mathematics. His maths teacher, Mr Randolph, declared him to be a "genius" after being shown an algebraic exposition. Randolph at first thought Turing must have copied it from a book, but he had worked it out from first principles. But this counted for little at a school that valued the humanities and classics. Generally, his work was so poorly presented that it was thought he ought to be sent down. As his headmaster remarked: "It is only the shallowest of minds that can suppose ... scientific discovery brings us appreciably nearer the solution of the riddles of the universe." He considered Turing "anti-social" and said that he was "the kind of boy who is bound to be a problem in any kind of school", though the headmaster did concede that Turing had "special gifts". His only real friend at Sherborne was Christopher Morcom, who, like Turing, had an interest in science. Together they discussed the latest scientific news and conducted their own experiments. The stimulus for communication and competition came only from another very able pupil at Sherborne, Christopher Morcom, to whom he found himself powerfully attracted. Morcom gave Turing a vital period of intellectual companionship. I feel that I shall meet Morcom again somewhere and that there will be some work for us to do together as there was for us to do here... It never seems to have occurred to me to make other friends besides Morcom, he made everyone else seem so ordinary. He (Christopher Morcom's photograph) is on my table now, encouraging me to work hard. His way of coming to terms with Morcom's death was to focus on his scientific studies in an attempt to fulfill his friend's potential. Morcom, who appeared to be the more gifted of the two boys, had already won a scholarship to Cambridge University. Turing believed it was his duty also to win a place at Cambridge, and then to make the discoveries his friend would otherwise have made. Question 1: Study source 2. Why did Alan have problems at Hazel Hurst Preparatory School? Question 2: How did Alan Turing's mother deal with his "appalling school reports at Sherborne"? Question 3: Make a list of the teacher's comments at Sherborne that (a) praised (b) criticized Alan Turing. Question 4: Select passages from the sources that explain why Alan Turing became friends with Christopher Morcom. Question 5: How does source 10 help us understand what Alan Turing meant in his letter to Christopher Morcom's mother (source 9)?